Eagle, Idaho - A few years back, the market was crying out for a low-cost and honest precious metals dealer – and I launched Money Metals Exchange with the goal of transforming the way Americans think about saving and investing. Our rapid progress in helping Americans switch a portion of their paper dollars into the safety and security of precious metals demonstrates the incredible potentialMoney Metalshas to be an agent of change in the marketplace. Many of Money Metals' original customers learned about us because they were subscribers to Independent Living, a self-reliance advisory published by American Lantern Press (ALP). In fact, I co-founded the Independent Living newsletter in 2006 and had the honor of guiding its enormous growth while serving as president of ALP. From new website features to more offerings and high-quality content, this exciting development allows Money Metals' full leadership team to focus like a laser beam on meeting the specific needs of our existing precious metals customers while stepping up efforts to popularize precious metals ownership in America. Leading Money Metals Exchange to new heights is fulfilling work, particularly after my long career in Washington, DC. As a leader in a national grassroots organization for 15 years, I have first-hand experience with how difficult it can be to change the direction of suicidal federal fiscal and monetary policies. It frankly matters little who controls Congress and the White House. The bureaucracies (including the Federal Reserve) are marching undeterred in the same direction. Fortunately, a great number of Americans are waking up to the fact that the solutions do not lie in Washington, DC. The solutions are within the people themselves. A growing number of folks are imposing a measure of accountability upon our bankrupt financial system by dumping their dollars and buying gold and silver instead. 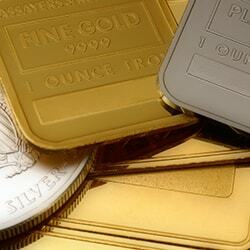 There are now more than 26,000 Americans who purchase their precious metals from Money Metals Exchange! Of those, almost 3,000 individuals are saving in real assets – month in and month out – through our monthly gold and silver savings plan. Our customers are taking decisive action, and we are honored to help them. And more customers than ever jumped on the opportunity presented in 2013 to add to their positions (or make their first purchases) before gold and silver resume their long march higher. Thank you for allowing us to play an ongoing role in your financial life. We take the responsibility very seriously.